I love watching our adult children do a better job of training their children than we did! I have watched and learned as they train our grandchildren. For instance, I really wish we had trained our children to always respond when we instructed or directed them. I have watched little minds struggling with their own wills and not wanting to obey their daddy or mama. Then, when they respond with a simple “Yes, Mama” or “Yes, Papa”, they humbly submit their wills to the will of their parents. Obedience is simple after that! Having our children respond to our words also lets us know that they’ve heard us. 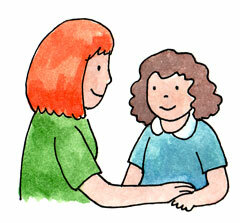 A verbal response helps them make a commitment to follow through on what we have said to them. Saying “Yes, Daddy” or “Yes, sir” or whatever other response you decide to ask from them, helps them humble themselves and acknowledge that they are under authority. In a future post, we’ll talk about teaching our children to respectfully appeal, when appropriate.